Experience a thrill like no other on this full-day whitewater rafting trip! 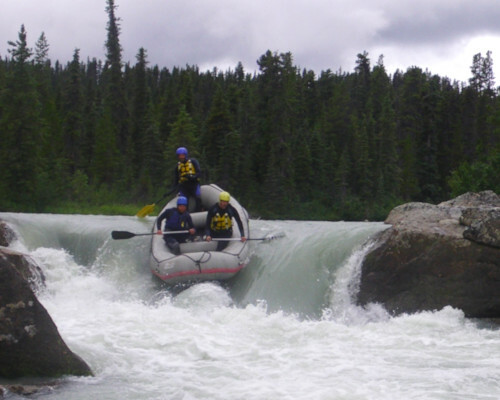 Navigate class III-V rapids in a pristine sub-alpine setting on the beautiful and powerful Tutshi River. Min. Weight: None Max. Weight: 250 lbs. Food: Picnic style lunch, tea and hot chocolate offered after rafting. Provided Equipment: Wetsuits, neoprene river booties, PFD, helmet, paddle. Recommended clothing: Guests should wear only wool or synthetic fabric for any items worn underneath their wetsuit (no cotton). Guests should bring a towel to dry off after the river before changing back into their own clothing. Medical Restrictions: This is a physically strenuous activity. Guests may swim through whitewater. Guests need to be able to paddle the raft with confidence and help to carry the raft over short portages. It is the guest's responsibility to determine that they are physically and mentally able to participate in the activity. No pregnant women. Pertinent medical conditions must be disclosed to the guide. Experience whitewater thrills on this exciting and strenuous full-day whitewater rafting trip! Meet your guide on the pier and begin your journey with a narrated drive through historic downtown Skagway. Continue north up the White Pass and into beautiful northern British Columbia. After a brief stop at Canadian customs (passports required), head to the river put in. There, you will be fitted for wet suits and other river gear. 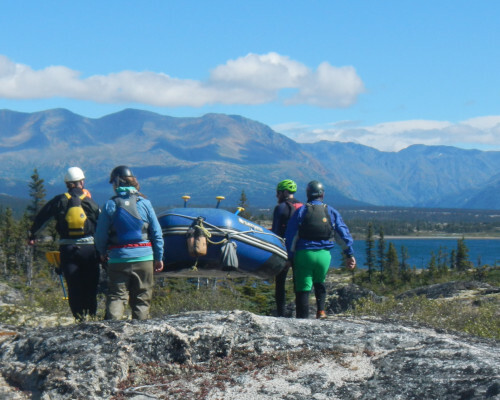 After receiving a safety briefing from your guide, your group will cross a series of small lakes which lead to the start of the Tutshi (pronounced “too-shy”) river. Guests will paddle through the flat water sections which may take 30-45 minutes depending on the day and the group. The flat lakes and smooth entry soon give way to a technical, class III river as you head into the canyon. Your expert guide will navigate your raft through this incredibly fun section with the help of the group to paddle through. The trip soon makes it way to the first in a series of class IV and V rapids. 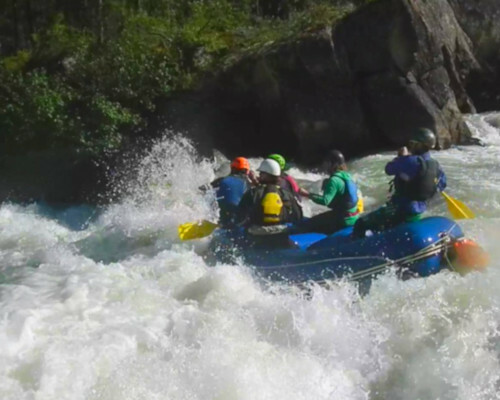 Big drops and powerful waves crash into your raft as the group works together to power through the river’s torrent. After the final rapid, a gentle float to our take-out allows for some swimming and celebration that your group was not “too shy for the Tutshi!” Each of these more technical rapids can be avoided by walking around the rapid. Depending on the group, river flow, and conditions, your guide may elect to do this on one or more of the rapids. After your river trip, we’ll do a short portage back up to the road system and enjoy a hot beverage while you change back into your clothes. A delicious lunch is served en route to Skagway while you marvel at the amazing scenery of “tormented valley” and the White Pass. A brief photo stop will be made at the “Welcome to Alaska” sign for an unforgettable group photo before you return to your ship. This river trip contains class III-V whitewater. We will scout all the major rapids and guests will have the option to walk around any rapid they feel uncomfortable rafting. Your guide will meet you 15 minutes prior to the tour start time to make sure all necessary paperwork is completed. If you are arriving by cruise ship, your guide will meet you at the end of the pier that your ship docks at. Otherwise the meeting location is the Small Boat Harbor sign. CLICK HERE to see a map detailing these locations in Skagway. Your guide will be holding a sign that says "Skagway and Haines Excursions". You guides are experts in the industry. 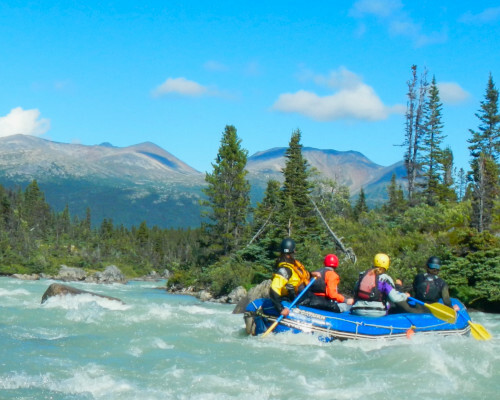 They are fun, well-trained and passionate about whitewater guiding and sharing their expert knowledge about the history and natural wonder of Skagway, Alaska with you! Our staff all go through extensive training and hold current first-aid (mostly WFR and WEMT) certification and swift water rescue certification. 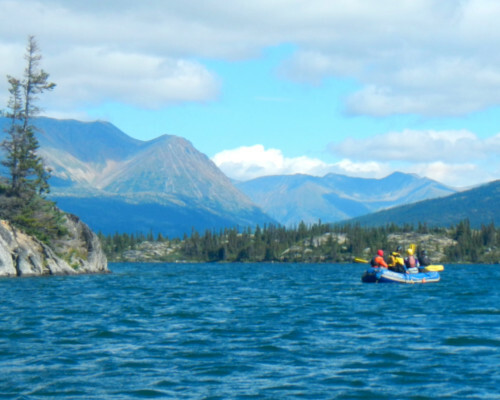 Many of our guides also lead courses and guided expedition trips for us both in Alaska and throughout the world. Yes – restrooms are available on the dock prior to departing for your tour and a non-flushing “outhouse” style restroom before arriving at the start of the hike. There aren't any restrooms while out on the river. Will I be expected to paddle? Yes, you'll be expected to paddle as a part of the team on the river, and take direction from the guide. You'll also be expected to help carry the raft on the short portages. We provide a wet suit, river booties/neoprene socks paddle, a PFD and a helmet. There will be a privacy screen available at the put in for changing into and out of wet suits. Though wildlife can never be guaranteed, Bald Eagles, ravens, squirrels and harbor seals are frequently seen in Skagway. Skagway’s unique landscape somewhat isolate’s it from many of the larger mammals apart from the occasional black bear or coastal brown bear. What are the rapids like? This river trip contains class III-V whitewater, depending on the time of the summer and water flow. The upper section has extended class III whitewater. Lower on the river, there are a series of more substantial drops. We will scout all the major rapids and guests will have the option to walk around any rapid they feel uncomfortable rafting.